Reasonably looking place, and it was nice and warm the winter night I was in. The bar area was fine, but it appeared only the public one as such was being used. Could do with some work on it, like starting with the music which was aimed for a group a lot younger than who use the place. Three real ales on and that included London pride, so naturally with this being deepest Hertfordshire I avoided. I had the Black Sheep winter dark ale, named after one of those reindeers without the shiny nose, and it was great. Had two it was so good, but £3.85 a pint was pushing it. Only food served it appears is at lunch time. Good loos. First visit in a couple of years. Seven of the eight pumps on tap. Good range including Brentwood Peasants Revolt, Cottage Big Ben, Theakstons Old Peculiar, and Deuchars. Beer kept well but feet sticking to floor and had to wash hands after straightening table. Won't be coming back in foreseeable future. Visited for a quick pint and found this place to be pleasant enough. there were three real ales on offer, I chose the Thwaites Wainwright but it wasn't quite up to it's normal high standard, the virtual lack of head possibly took the edge of it for me, and at �3.10 per pint, a little expensive, even in these times. The pub itself was interesting with seperate rooms and what appeared to be friendly enough locals. There was a live acoustic set in a room to the rear, but the �4 entry curtailed my interest as I was only stopping for one beer. Would visit again, but it was more average to good, than exceptional. 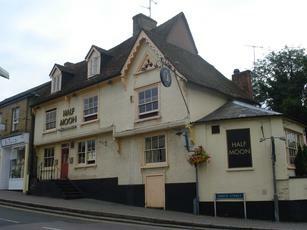 The Half Moon is OK but it always smells of damp!